Ajnaware’s latest app “See Breeze” has just been approved by Apple, and is now available from the app store. This app has a universal binary – so can be installed onto either iPhone 3GS or onto iPad from the same purchase. 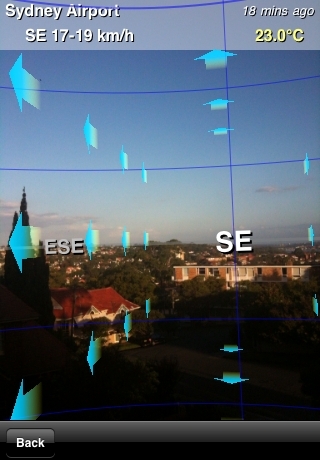 Like Sun Seeker, this app pushes the boundaries of what augmented reality on mobile devices can be used for. The app description is as follows. 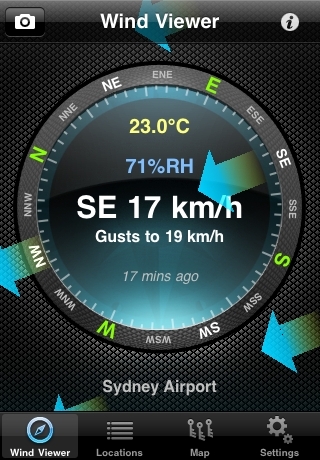 Provides both a FLAT VIEW COMPASS and an AUGMENTED REALITY 3-D VIEW showing the local wind and weather conditions with animated wind vectors. I had the idea for this app about the same time as I had the idea for Sun Seeker, but I had to choose just one to do first, and even when I did start it, I found that it took a lot longer than expected due to the various technical challenges involved. The first major challenge was learning some OpenGL ES, and the second one was figuring out how to get OpenGL ES to respond correctly to device orientation and heading changes. Many thanks to Jeff LaMarche for some great blog articles on the former, and as for the latter, I pretty much had to figure it out for myself. I did post on Stack Overflow, but ended up answering my own question. Adapting the app to iPad was also an interesting issue to deal with. I ended up with quite a few conditional branches in the code to deal with cosmetic differences. But the end result more than justified the extra effort. It looks superb on the iPad. Credit for the excellent app artwork goes to Peter Fellows once again, whose work on the Oz Weather program was brilliant. Here are a few screenshots from the iPhone app.